There are 29 minerals from Asia and Australia. 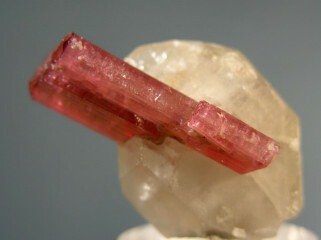 Light pink, very gemmy and lustrous hexagonal prisms of apatite to 1.1 cm, with minor muscovite attached on one side. The only contact is natural and in the rear! Very sharp pseudo cubic crystals of apophyllite to 5 MM are perched on clear to white radiating, terminated blades of scolectite. Very fine! 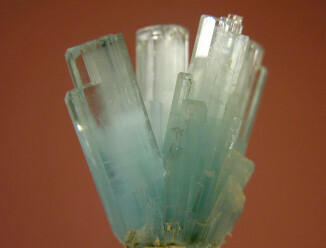 A group of approximately 12 medium blue crystals that run from milky to gemmy, of the aquamarine variety of beryl, in parallel growth forming a divergent spray with textbook, complete terminations. There is one small broken crystal which prevents it from being a 360 degree rock, but as you can see from the photos, this miniature displays beautifully and is actually a good companion to the indicolite (no. 3449). Choice! 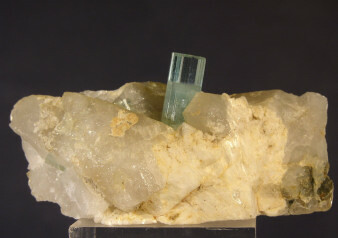 A very unusually zoned aquamarine crystal with an exceptional termination and a cloudy core that forms a hexagonal outline within the crystal. As you can see, the beryl is cloudy up until the termination, drawing a very distinct line and then becomes of faceting grade. This wonderful crystal sits on a matrix of quartz, feldspar and a smaller beryl on one side. Super! A medium green, lustrous emerald crystals with a flat termination measuring 2.7 cm sits vertically on a very dark schist matrix alongside a 2.5 cm emerald crystal that’s lying horizontally on it’s left. A very rare beryl from Afghanistan, I have seen very few emeralds from this locality on the market. A pair of water clear prisms of calcite on matrix. There’s a tiny nick on one of the terminations. This little guy was found during an excavation near the airport in Skardu, and I don’t think there’ll be any more. A find for the serious calcite collector! 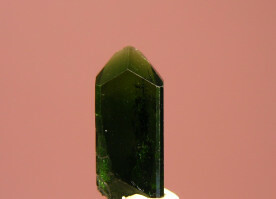 A deep green, translucent crystal of the chromium variety of diopside. Perfect crystal! 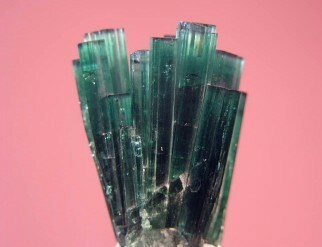 A multicolored, beautifully terminated, lustrous single crystal of elbaite with gemmy areas and a pair of smaller crystals and minor mica attached on one side. The colors range from yellow to orange to a brownish red. 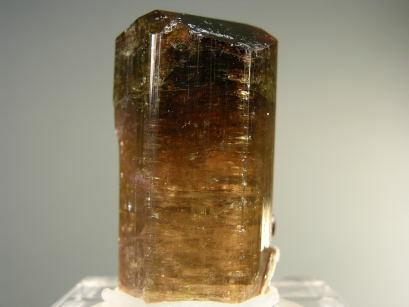 It might be better to call this tourmaline, since there are dravites that come from this locality also that resemble this one, but the old labels said elbaite. An important crystal from this obscure locality! 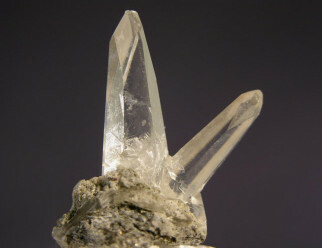 A group of approximately 17 crystals of the indicolite variety of elbaite in parallel growth forming a divergent spray. The color is a transparent deep greenish blue (with more blue than green), the luster is excellent and the terminations are sharp and clean, except for two, which do not affect the display. A wonderful small miniature! A very pretty miniature of elbaite crystals with an intense red color and darker tips sits on a doubly terminated quartz crystal. 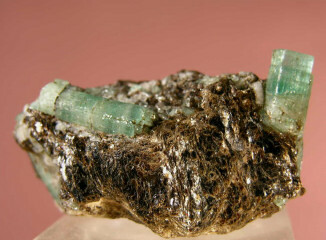 Very unusual to find these tourmalines on matrix.